The family has traditionally played an important role in providing care at home. However, ageing societies and the increase in female labour force participation are putting pressure on governments to take a more active role. Several countries have already done so. Germany, for example, introduced a universal long-term care insurance programme in 1996, making subsidies available to both informal and formal care providers. When policymakers consider reform scenarios, it is of utmost importance that they take into account the magnitude of the response of informal (i.e. family) caregiving. If, for example, a country with high out-of-pocket expenditures on nursing homes (say, the US) were to introduce free nursing home care, one would expect a sizeable number of elderly, who were previously taken care of informally at home, to move to nursing homes. As with tax changes and labour supply, a naïve calculation that doesn’t take into account this reaction of families would vastly underestimate the costs of the reform. But, how many families will respond in this way? In order to get a first handle on this question, in this column we exploit the large policy variation that exists between several European countries and the US, in combination with survey data on long-term care (LTC). Unfortunately, comprehensive cross-country data on LTC are hard to come by, especially when it comes to informal care. The OECD and the European Commission (OECD/EU 2013, Lipszyc et al. 2012) provide excellent aggregate data on formal care provision across countries, both for nursing homes and formal home care (i.e. a paid caregiver in the home). However, these datasets lack information on informal care. The academic literature (discussed below) has used survey evidence to study several questions regarding informal caregiving but does not provide a comprehensive overview of caregiving because it excludes certain forms of care, usually nursing home care and spousal care. Our recent paper aims to fill this gap in the literature by drawing on three datasets: the Survey of Health, Ageing, and Retirement in Europe (SHARE), the Health and Retirement Study (HRS) in the US, and the OECD cross-country data for nursing home utilisation (Barczyk and Kredler 2018). We describe in detail how we overcome several challenges to bring these data sources together and obtain a big picture of care provision across countries. In general, LTC can be provided in different settings: informally by family members or friends (informal care) or formally. Formal care is again subdivided into care given by paid helpers in the elderly’s home (formal home care) and care given in nursing homes. For a comprehensive cross-country examination of LTC, all these sources of care need to be considered, which is what we do. We divide countries into three groups based on how much their governments spend on LTC; note that almost all expenditures for LTC are on formal care. The region ‘North’ comprises countries whose public spending on LTC exceeds 2% of GDP (Sweden, Denmark, Netherlands, Belgium). ‘Middle’ countries are defined as those with public LTC spending between 1% and 2% of GDP, all of which are found in the centre of Europe (France, Germany, Austria). The remaining countries make up the region ‘South’ (Spain, Italy) and have public LTC spending below 1% of GDP. We consider the US, whose government spends 0.5% of GDP on LTC, as a region apart since its LTC policy and other characteristics make it very different from the European countries. Table 1 below provides a broad overview of care arrangements, ordering countries by their public spending on LTC. The first noteworthy observation is that care arrangements vary strongly across regions. 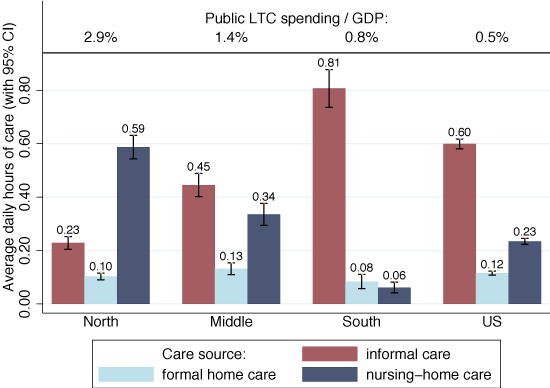 Informal care displays a steep North-South gradient in Europe – when moving North, public spending on LTC increases, while informal care is displaced by formal care. Interestingly, the US most resembles Southern Europe in its reliance on informal care – it has an even higher percentage of recipients of such care than the South – however, its nursing home population is most comparable to the Middle. Notes: All respondents aged 65 and above who receive care (SHARE: Waves 1, 2, 5, and 6; HRS: Waves 5-11). Source for last column: OECD. The large informal care gradient across regions strongly indicates that generous LTC policies crowd out family-provided care. This conclusion becomes almost inevitable when comparing Middle, North, and the US. The countries in these regions share very similar cultural backgrounds, yet their reliance on family caregiving differs enormously – in the US, informal care is used three times more often than in the North. Within Europe, culturally similar countries such as the Netherlands and Germany display very different care arrangements, and again the outcomes are exactly in line with how much their governments subsidise formal care. Given these observations, one cannot help concluding that families respond strongly to policy incentives when deciding on care arrangements. 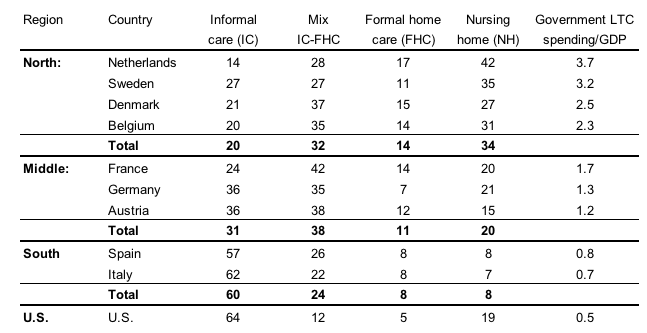 A second striking feature that emerges from Table 1 is that a substantial number of frail elderly who live at home receive a mix of care from informal and formal sources. This finding at first seems to contradict previous studies (e.g. Bonsang 2009) which found that informal care and formal home care are substitutes. However, this puzzle is resolved once we take into account the intensity of caregiving. The vast majority of individuals who combine informal care and formal home care actually receive care from one main source - about 90% of these individuals receive 80% or more care hours from the dominant source in all regions. In general, case counts may be misleading since they fail to account for the intensity of care – a person who needs occasional help, say, with shopping counts the same as a nursing-home resident with severe dementia who needs care around the clock. Figure 1 corrects for this by reporting the average daily hours of care that people above 65 years-old report from the different sources. As may be expected, the importance of nursing homes increases dramatically since they disproportionally cater to those with the highest care needs. Formal home care loses importance, since it tends to be used in milder cases of disability. Informal care, on the other hand, stays very prominent. Finally, we note that the North-South informal care gradient becomes, if anything, stronger once we account for care intensity. The US is now positioned between the South and the Middle, but still far away from the North. Note: Figure shows average hours of care received from different sources with 95% confidence intervals. All individuals aged 65 and above (SHARE: Waves 1-2, HRS: Waves 5-11). Also, we find that widow(er)s and singles are particularly responsive to LTC policies – the North-South informal care gradient is even stronger in this subgroup. Couples seem less responsive to policy, as partners almost invariably take care of their spouse in all regions (the North being a notable exception, where almost half of all care hours received by partnered individuals is administered by nursing homes). One may suspect that the strong correlation between LTC policies and care arrangements is a statistical artefact in the sense that other characteristics of the countries in the sample are actually responsible for the differences in care choices. However, we find that the strong gradient persists even when we control for a wide range of family characteristics. In fact, the information in which country or region a person resides is as predictive as the strongest individual-level predictors (e.g. the level of disability or partnership status) for the care decision. This is striking, since for many economic outcomes researchers have found that individual-level variation is an order of magnitude larger than variation between countries. The vast majority of informal care is provided by a relatively small number of heavy helpers who provide care to severely disabled elderly. Among couples, it is almost always the spouse who is the main care provider. For single elderly in need of care, a child typically takes on this role. These caregiving children are typically female, of working age, and often co-reside with the parent. They therefore face potentially important trade-offs between marketplace work and care provision (see also Bolin et al. 2008, Crespo and Mira 2014). So, taking seriously the responses of families to economic incentives, what are the policy implications? In our paper we build an economic model in which parents and children interact strategically in the care decision, and use it to study how LTC reforms of the type implemented in Germany would fare in the US context (Barczyk and Kredler 2017). We find that informal care responds strongly to even relatively small subsidies, which is in line with the large informal care gradient we found across countries. Furthermore, an informal care subsidy substantially reduces reliance on Medicaid (the means-tested US government programme that pays for formal care), while the reduction of tax revenues due to lower labour supply by caregivers is modest. The informal care subsidy turns out to be welfare-improving – it keeps the elderly at home with the family (which they like), and is relatively cheap as the increase in government spending on the subsidy is largely compensated by the savings from a reduced Medicaid programme. Barczyk, D and M Kredler (2017), “Evaluating long-term-care policies: Taking the family seriously”, Review of Economic Studies, forthcoming. Barczyk, D and M Kredler (2018), “Long-term care across Europe and the US: The role of informal and formal care”, Working paper. Bolin, K, B Lindgren and P Lundborg (2008), “Your next of kin or your own career? : Caring and working among the 50+ of Europe”, Journal of Health Economics 27(3): 718–738. Bonsang, E (2009), “Does informal care from children to their elderly parents substitute for formal care in Europe?” Journal of Health Economics 28(1): 143–154. Börsch-Supan, A and H Jürges (eds) (2005), The Survey of Health, Ageing and Retirement in Europe – Methodology, Mannheim Research Institute for the Economics of Aging (MEA). Crespo, L and P Mira (2014), “Caregiving to elderly parents and employment status of European mature women”, Review of Economics and Statistics 96(4): 693–709. Lipszyc, B, E Sail, A Xavier, et al. (2012), “Long-term care: Need, use and expenditure in the EU-27”, Technical report, Directorate General Economic and Financial Affairs (DG ECFIN), European Commission. OECD/EU (2013), A good life in old age? Monitoring and improving quality in long-term care, OECD Publishing, Paris. Associate Professor of Economics, McGill University.